The meat in oxtails is especially suitable for cooking in a slow cooker. Because oxtail meat is usually tough and stringy, moisture and time are essential to tenderize and bring out the flavor of this meat. 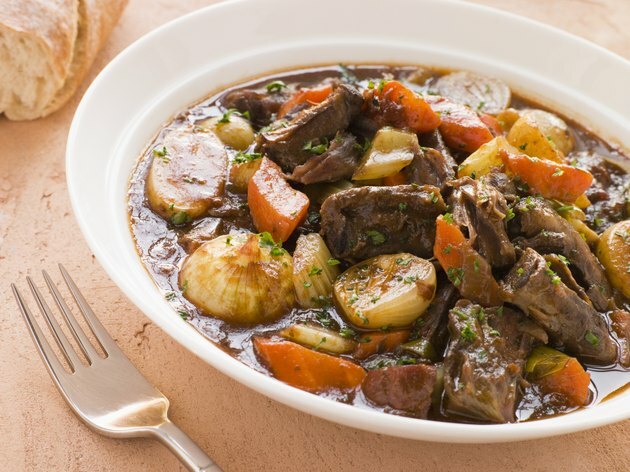 Although the most common ways to cook oxtails in a slow cooker are to make a soup or stew, slow cooking makes oxtails also suitable as a main dish. Trim away as much visible fat as you can on about 4 lbs. of oxtails. Use a sharp knife or kitchen scissors. Rub a handful of sea salt into the meat, using your hands to coat the oxtails thoroughly with salt. Place the oxtails in a container, cover, and let the salt work to flavor the meat for a minimum of two hours or overnight. Rinse your oxtails with cold water to remove all traces of salt. Sprinkle enough olive oil in a skillet to cover the bottom, heat to a medium-high heat, and saute three cloves of minced garlic until they start to brown. Add the oxtails and continue cooking until the oxtails are brown on all sides. Place your in your slow cooker, and add 1/2 tsp. dried, crushed tarragon and 1 tbsp. each of fresh, chopped rosemary, thyme and oregano -- or 1 tsp. each of dried, crushed rosemary, thyme and oregano. Add 2 cups of beef broth, 1/4 cup balsamic vinegar, and enough red wine so the liquid covers the meat by about 1 inch. Stir to mix the spice and liquid mixture, set your slow cooker to the low heat setting, and cook overnight -- or for about eight hours. Monitor your crockpot as the oxtails cook, and add red wine as necessary to keep the liquid 1 inch above the meat. Turn your slow cooker to high, add two leeks cut in 1/8-inch pieces. Cook for an additional 30 minutes to thicken the sauce. Skim off all visible fat with a strainer before serving. Trim away as much visible fat as you can on 3 to 4 lbs. of oxtails. Use a sharp knife or kitchen scissors. Place your oxtails on a broiler rack, and broil for 15 to 20 minutes to brown. Place your oxtails in your slow cooker, and add two sliced onions, one sliced carrot, three peeled, cubed potatoes, 1/2 tsp. dried thyme, 1 bay leaf, 2 tsp. salt and 1/8 tsp. pepper. Cover the meat and seasonings with a liquid mixture of 1 cup of beef broth and 3 tbsp. ketchup. Set your slow cooker to low, and cook for 10 to 12 hours. Turn your low cooker to high for the last 60 minutes of cooking. Add a mixture of 3 tbsp. flour and 1/4 cup water, then replace the cover and allows the sauce to thicken. If you prefer boneless oxtails, using a spatula to remove the meat from your slow cooker and then use a fork to pull meat from the bones.